Summary: Knowledge of sea turtle migratory corridors, foraging grounds, and inter-nesting areas is critical to sea turtle management and conservation. 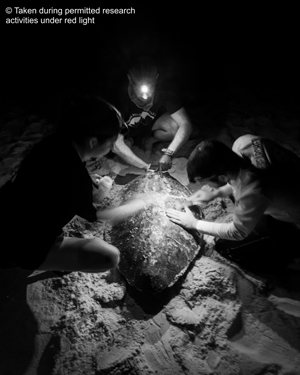 Satellite telemetry and stable isotope analysis (SIA) are commonly used techniques for tracking sea turtle movements and identifying foraging areas. Epibionts, animals that colonize the surface of living organisms, colonize sea turtles at their foraging grounds and may thus be used to determine broad areas where nesting sea turtles forage. Here we aim to collect baseline information on the epibiont assemblage of turtles nesting at St. George Island, part of the Northern Gulf of Mexico Recovery Unit. We will integrate our data on epibiosis with SIA to identify and assess the broad foraging areas, and further compare our data to nest inventory data to determine the effects of foraging area on measures of reproductive success. To reach our goals we will conduct fieldwork at St. George Island during the peak of the loggerhead nesting season, approximately two weeks in June, 2018. We will collect morphometric and population data, as well as epibionts and tissue samples for SIA from encountered turtles. Epibionts and SIA will be identified and analyzed, respectively, in the second half of 2018. Various linear models and post-hoc tests will be used to determine significant relationships between epibiont data, SIA, and nest inventory data.